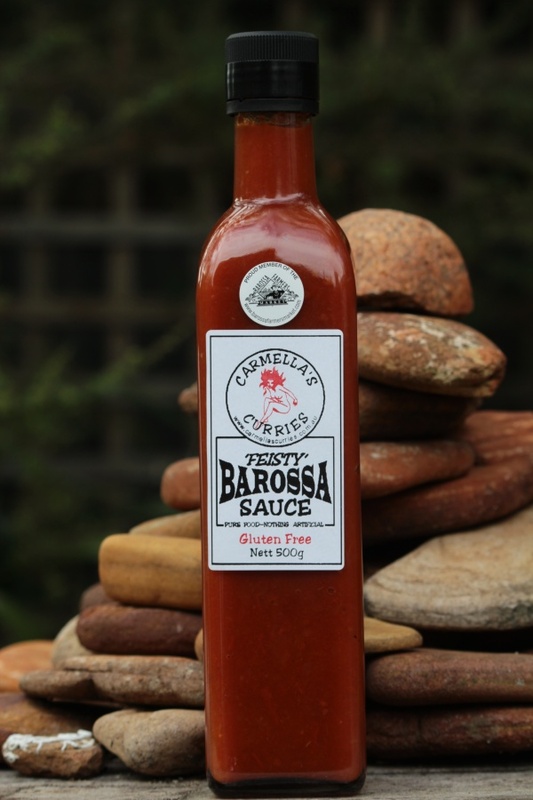 commented on "Due to popular demand I have developed this bold, rich tomato ..."
sauce, capturing the essence of the always evolving food traditions of the Barossa. Definition: - A Spirited, Frisky and Plucky Tomato Sauce, especially made for Men (but not exclusively girls!) who enjoy a bit of Spice in their Lives! Well folks I finally got around to developing the beautiful homemade Tomato Sauce I have been thinking about for some time now. After making a number of different batches and after getting all my friends and local butchers to try them all, I settled at last on the perfect balance of a sweet and slightly spicy sauce. It's a bold, rich, tomato sauce with a 'Feisty' amount of spice in it without being TOO hot! I launched it at the Barossa Farmers Market last weekend and it was so well received that I SOLD OUT of over 60 bottles! I put on a free sausage sizzle using Schulz Butchers deliciously juicy Pork sausages and everyone loved it! It comes in a lovely big 500g bottle, is Gluten Free like all my products and free of any artificial preservatives and additives!